Abstract: The IBM AI Horizons Network is a new IBM Research program that brings IBM Researchers, world-class faculty, and top graduate students from top-tier universities to work together on a series of advanced research projects and experiments designed to accelerate the application of artificial intelligence, machine learning, and natural language processing and related technologies. 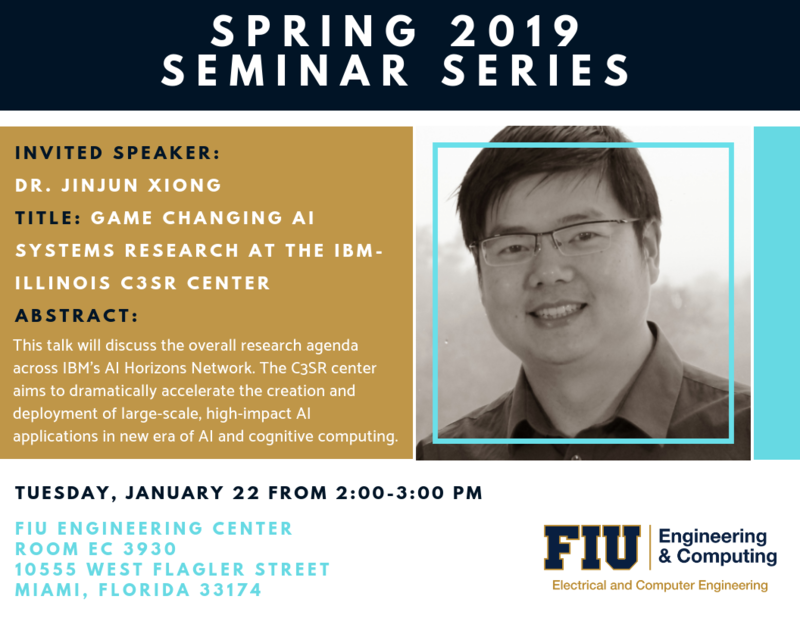 This talk will discuss the overall research agenda across IBM’s AI Horizons Network, in particular, with a focus on the long term research vision of the IBM-ILLINOIS Center for Cognitive Computing Systems Research (C3SR). The C3SR center aims to dramatically accelerate the creation and deployment of large-scale, high-impact AI applications in the new era of AI and cognitive computing. Biography: Dr. Jinjun Xiong is currently the Program Director for Cognitive Computing Systems Research at the IBM Thomas J. Watson Research Center. He is responsible for defining the scientific agenda and strategic directions for advanced cognitive computing systems research across industries, academia and governmental agencies. In that capacity, he co-directs the IBM-Illinois Center for Cognitive Computing Systems Research (C3SR). Dr. Xiong’s research interests include cognitive computing systems, big data analytics, deep learning, smarter energy, and application of cognitive computing for industrial solutions. He has published more than 100 papers in top-tier international conferences (including DAC, ICCAD, ASP-DAC, ASPLOS, MICRO, NIPS, KDD, AAAI, ICRL, ECCV, ACL etc. ), among which four received Best Paper Awards and eight received Best Paper Award Nominations. For more information on the event, visit FIU's Events Calendar.